Sue, thanks for the answer. I thought the question might be helpful to others on the board too. I heard back from Canvas right away, and they said any cours credit is dependent upon the institution offering the course; and in this case no. Sue, about the course you mentioned...I see it's sponsored by Ball State and that a certificate of complete is provided; but what do you know about actual course credit? As a teacher, I'm always needing re-certification credits. I've sent the canvas network folks the same question, but you're always so in the know, I thought you might already know. Have you asked at imdb.com? They have a message board called, Need to Know, just for these sorts of questions. Sue, Sorry we never got a chance to meet. Making connections with other folks is one of the areas I was a bit disappointed with during the festival. But it's probably my own fault, I can be a little reserved at times like that. Overall I had a great time. Saw 9 films and a few very interesting Club discussions. It was great to have the stars and guest speakers introduce their films! Maybe in a few years we'll go again. It's a very expensive vacation for us; the travel expense alone is over 5K! I'll look forward to watching your future posts during the next festival! Take Care! Having a great time! Went to Christmas in July and Man Who Would Be King today. Going to Dream Machine tonight! We were at Plummer's ceremony, too! My wife and I were last folks let into the Spolight Pass sitting area! Sitting in the local airport, waiting for my flight! Hollywood, here I come! While the Red Carpet starts at the same time as the Opening Party, the thing to keep in mind is that the Opening Night film and discussion doesn't start until closer to 7:00. 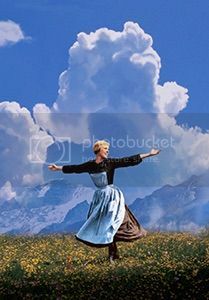 While The Sound of Music will likely be sold out it will depend on your pass as to what you should do. If you have the Spotlight pass, you can probably glide through the Opening Party on your way to the Red Carpet and take time to have a complimentary Gin and Tonic or beer. If you have an Essential pass, I would suggest hitting the Red Carpet at the start time and get your queue number as soon as possible to avoid being far down in the line. The Egyptian seats about 616 so keep that mind in trying to figure out just where in the line you want to be. If you are just going to sit in the bleachers and watch others walk the Red Carpet, that will depend on your movie of choice. The Lizbeth Scott film, No Time for Tears and The Man Who Shot Liberty Valance are both very popular with festival goers who aren't going to the Opening Night film. Me, I plan to get in line at 5:00 for Liberty, so for the first time in 6 years, I am foregoing the Opening Night party. There is always the Closing Night Party and plenty of other opportunities to hang out with other Festival goers, especially while you are standing in line. Cutter, thank you for the reply. We are Spotlight pass holders, so guess we'll be able to go with the flow of the evening! I am quite disappointed in this news. Getting the chance to meet Mr. Osborne was going to be one of the highlights of this trip! I wish him all the best and a speedy recovery, but will truly miss this opportunity to have met him. Rhodesisland, I am not having trouble with my IOS App at this time. Are you still experiencing difficulties? Are you using IOS or Android? Please let me know. Sawyer makes a pilgrimage to that muscial mountaintop. Using an iphone 6+. The app seems to work, but it shows old info. The fabulous TCM Film Festival App is now available on Android and IOS. Take a peek! It's free and very handy on your portable devices! Sue, the App seems to need an update. It's still listing Spartacus and has some weird times for some shows (11 am for Apollo 13?) If you have any connections to the folks that can work on it, could you drop them a word? My selections are pretty well made now too. My toughest timeframe was also Sunday afternoon! Children's Hour, in which my aunt has a small part and will be introduced by Shirley MacLaine...or the Clooney/Lopez action/romance Out of Sight which I enjoyed quite a bit at the time of its release...or Judgement at Nurenmberg which I just saw for the first time a few weeks ago... OR one of my wife's all time favorites, The Philadelphia Story!? Ok...so maybe the choice wasn't so tough after all! Now that the schedule is published, I see that the Welcoming Party at the Club TCM and the Red Carpet prior to SoM occur at the same time. What is the logistics of that? I'm just so surprised he hadn't received this honor already! Glad I might get a chance to see one of these ceremonies! MEGA-DITTOS to all the "tickled" and excitment! This is going to be a great festival and I can't believe that it's the one I am going to! Maybe I'll see you on the red carpet!! No replies here yet and I can't answer your question becuase I've not been to the FF yet. However, I can let you know in April! I was able to buy the Spotlight passes and will be doing the Red Carpet! Looking forward to it! Hope to see you there! I've checked my card statement and didn't find a charge for the Roosevelt. I've even called them back to confirm my reservation. Thanks! Look forward to it! Blast! I knew I shouldn't have let her buy those nice gowns! Should have made her wear jeans! Naw, just kidding. Guess it'll be fun to dress up! Now to buy a suit. Haven't owned one in more than a decade! Thanks for the advice! Sound as always! Sue, let me ask you a question. Just how dressy do we need to be for the red carpet events? Is a tux neccessary or will a suit suffice? Could I get away with jeans, a dress shirt and a jacket? My wife is planning on a evening dress or slacks suit so that's easy, but what about me? Purchased Spotlight passes, confirmed reservations at the Roosevelt, and purchased air tix! Thank you for the word! I appreciate it! I have signed up for the newsletter; I presume that the newsletter will give us a heads up before the actual date? I'll be sure to be ready in Nov.! When did ticket sales begin? Thank you all for the word! I appreciate it! We are planning on attending the Festival for the first time in 2015! I see that passes for 2014 are already selling out. When should I expect passes to become available for purchase for the 2015 Festival so that I can get the Essential pass?